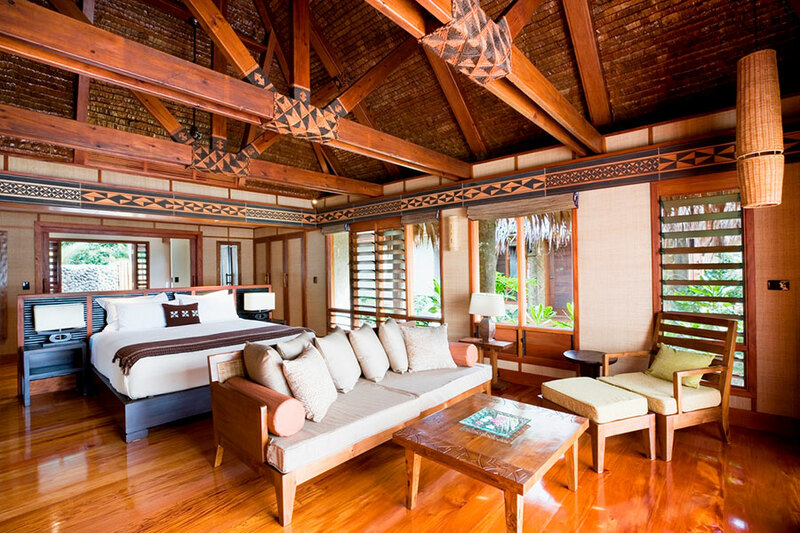 We designed this Fiji Overwater Bungalow Vacation for a young honeymoon couple from Toronto. They had their hearts set on an overwater bungalow in beautiful Fiji, so we sent them to the fabulous Likuliku Lagoon Resort—the only resort in Fiji with authentic overwater bungalows. 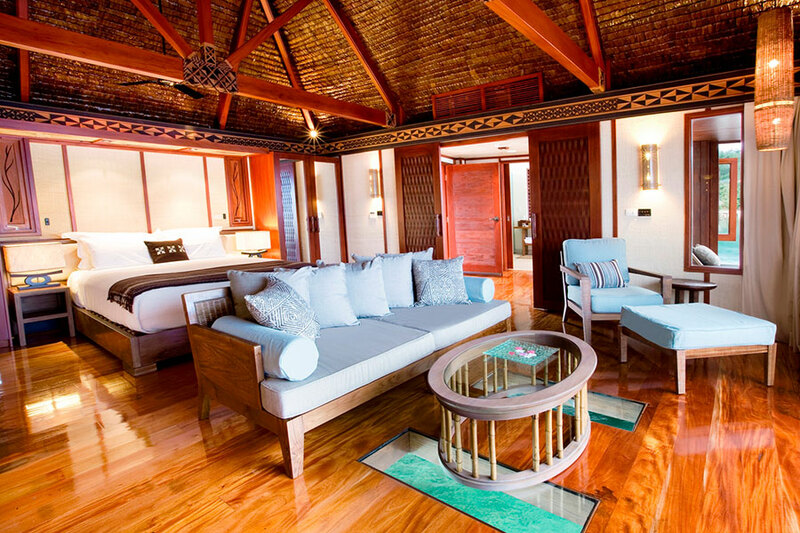 We also arranged for them to stay at the warm and welcoming Malolo Island Resort on the same island. It was the perfect combination: a rustic and intimate family-owned resort and a slick, romantic, and spectacular one with overwater bungalows. 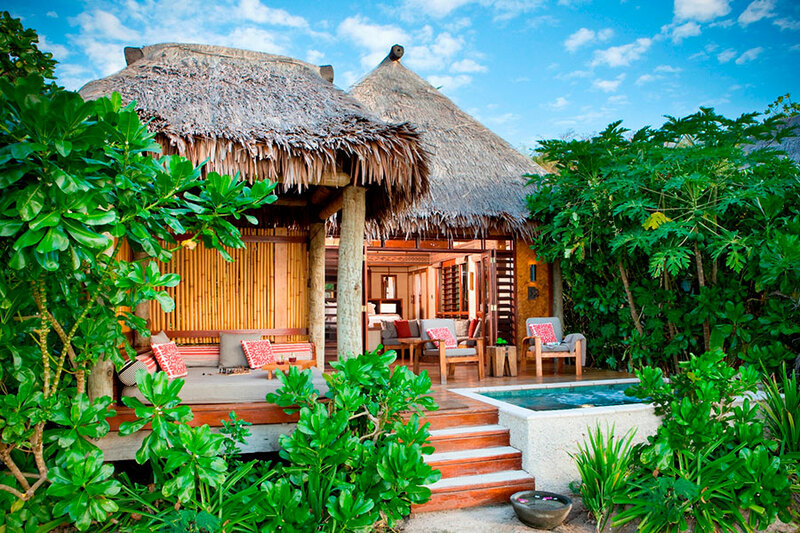 Their Fiji Overwater Bungalow Vacation began at Malolo Island Resort with a warm and heartfelt welcome. If there is one thing that remains unchallenged in the world of hospitality, it is the Fijian way. They felt instantly at home at Malolo, thanks to the big smiles of the local staff. They had a beautiful, airy, colonial-style bungalow right on the beach. They spent the first few days relaxing and getting into vacation mode, enjoying the sunshine and the fresh sea breezes. Next for their Fiji Overwater Bungalow Vacation, they spent 4 nights at the gorgeous Likuliku Lagoon Resort, the only one of its kind. 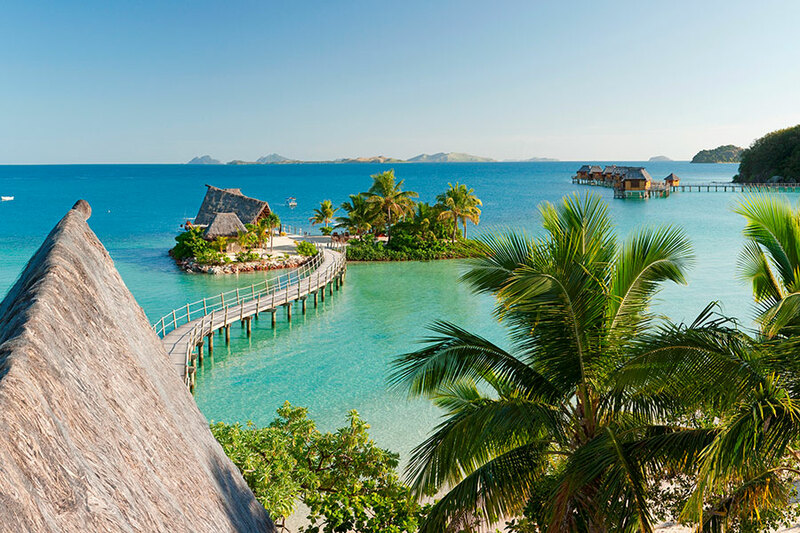 Likuliku features the only overwater bungalows in the Fijian islands, and the resort was so beautiful that one of our guests actually cried when she had to leave! Staying in an overwater bungalow was a special treat that exceeded all expectations. They had a ladder leading from their luxurious bungalow directly into the Pacific ocean, and a glass floor so they could see the rainbow-colored tropical fish swimming below. In the evenings, they were treated to delicious canapés and champagne, which they enjoyed on their large private balcony looking out over the ocean. They went snorkeling and paddle boarding in the warm waters, and we also arranged for them to enjoy a gourmet picnic on a white sand beach with no one else in sight. Their Fiji honeymoon was unforgettable. From their beautiful surroundings, to the fresh Pacific cuisine, to the famous hospitality of the local Fijians, they loved every minute of their special trip! Welcome to Fiji! You will arrive on an early morning flight into Nadi, the main international gateway. Board a catamaran for a quick trip to one of our favorite Fiji beach locations, Malolo Island Resort. 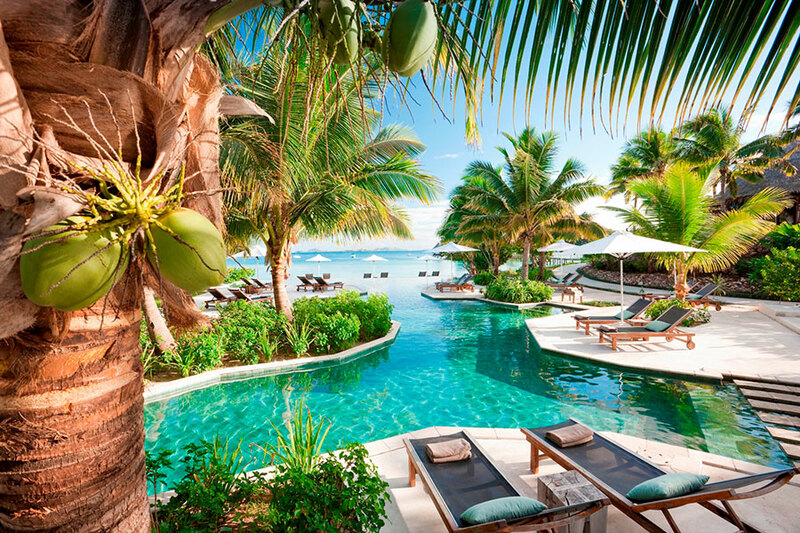 This rustic yet luxurious resort is owned by a Fijian family, and the friendly service you receive will make you feel like you’re visiting close friends at a private beach house! Enjoy the sounds of the coconut trees swaying and the ocean lapping the shore, under the bluest of skies by day and a blanket of stars by night. Your days are yours to enjoy at your leisure Fill them with activities or unwind and do nothing at all. Non-motorized water sports are complimentary, along with a weekly Meke performance (traditional Fijian dance). Optional activities include: snorkeling, kayaking, sailing, windsurfing, walking trails, beach volleyball, diving, water skiing, island hopping, dolphin spotting, local village trips, and fishing excursions. Celebrating something special? 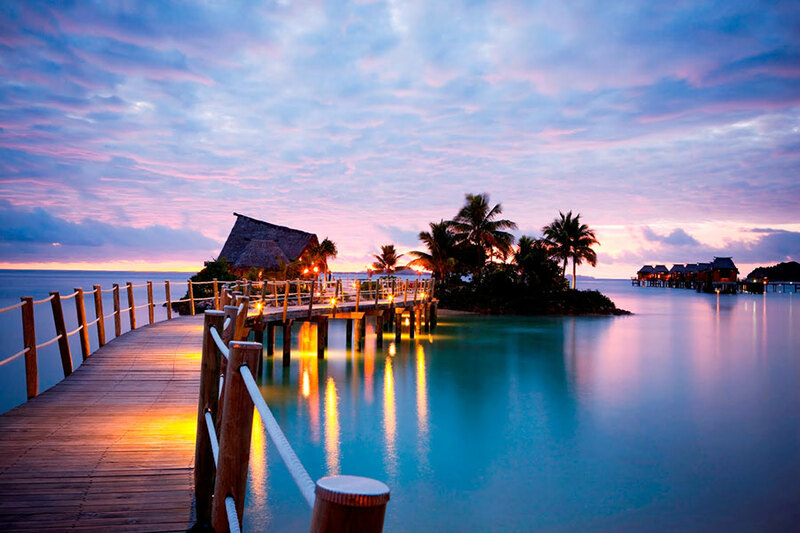 Grab a bottle of bubbles and walk to a secluded beach spot for a magnificent romantic sunset interlude, Fiji style. Today, you will say goodbye to your new friends at Malolo and move to the other side of the island and the wonderful Likuliku Lagoon Resort to stay in an overwater bungalow! Likuliku is a magical, adults-only getaway with calm waters and just 46 luxury bungalows, 10 of which are overwater bungalows. 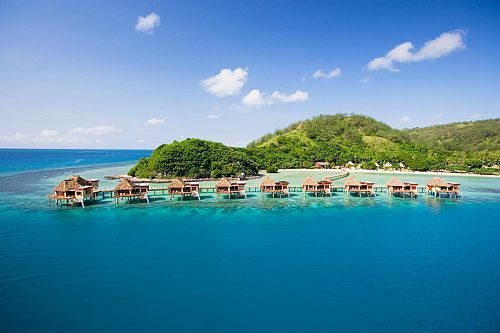 This is Fiji’s first and only beach resort with overwater bungalows, one of which will be your home for the next few nights! 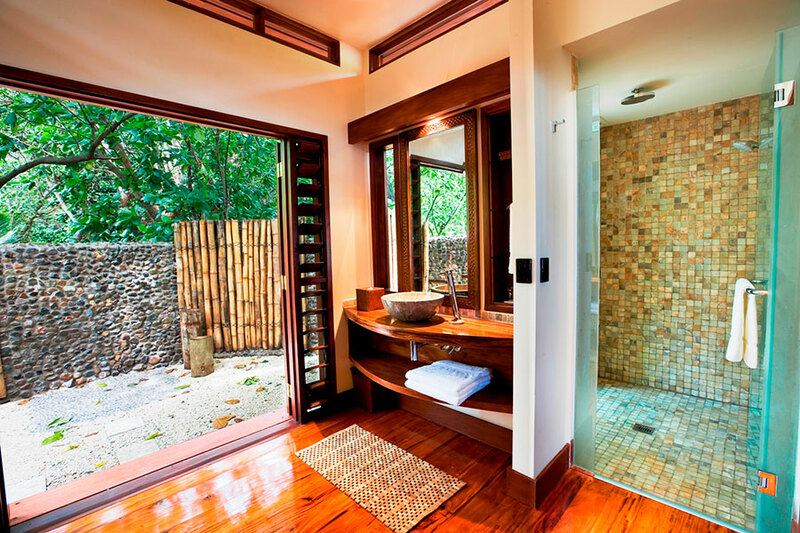 Private ladder access to your own piece of ocean, a magnificent standalone bath tub, and a glass floor to see the fish below are just a few of the fabulous finishing touches. 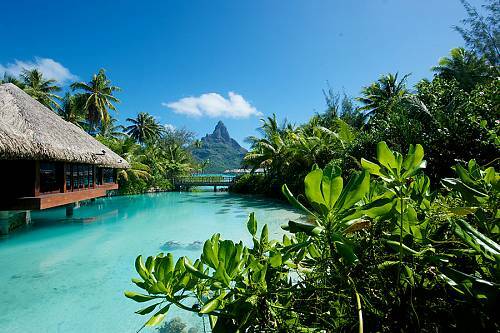 Wake up to see the tropical fish swimming below your overwater bungalow. 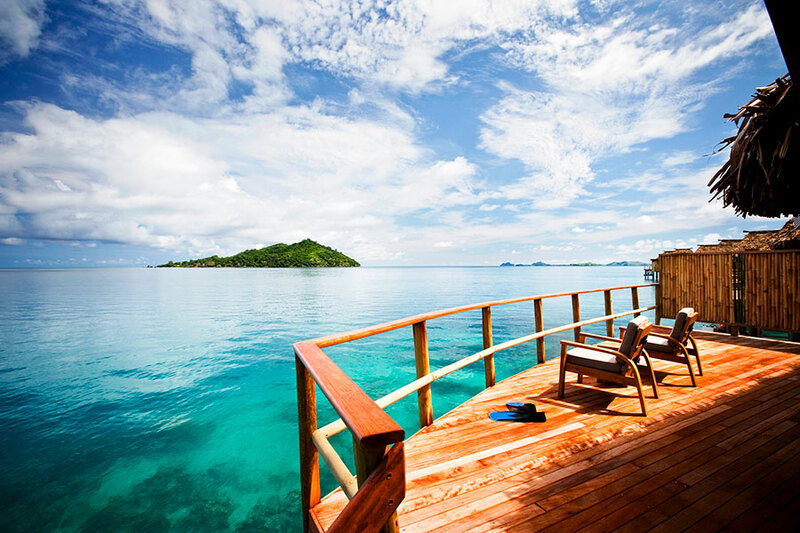 Climb down your private ladder for a morning snorkel before a delicious buffet breakfast. Spend the rest of your days at leisure—snorkeling the coral reef, strolling through the nature trails for spectacular views, or pampering yourself at the Likuliku spa. 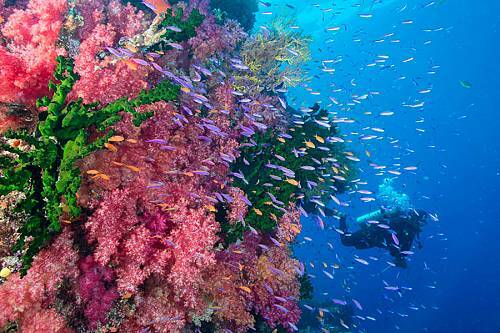 Enjoy a daily canapé plate with champagne as the living aquarium dazzles beneath you. You can also visit the local village and immerse yourself in Fijian culture, or perhaps participate in a traditional kava ceremony. 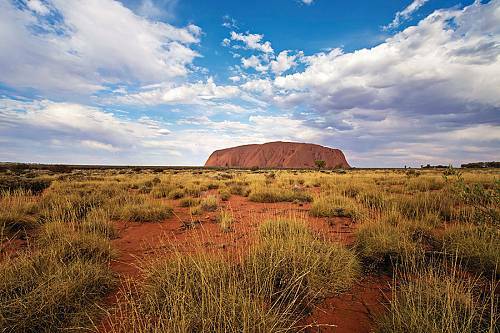 For a romantic day out, take a gourmet picnic out to a private beach or deserted sandbank. It’s time to say goodbye to the gorgeous Likuliku Lagoon Resort and take a boat back to Nadi airport. Catch your flight to Los Angeles, departing late in the evening and arriving the same day.